The Spanish Civil War officially ended on April 1, 1939. But by that time Europe was no longer dealing with a mere local conflict, but a war that would engulf the entire continent. It was time to unleash Hitler so he could do what the British needed him to do – attack the USSR. So Great Britain moved quickly to “finish off” the Republicans in order to bring the war in Spain to its conclusion as quickly as possible. On February 27, 1939, Britain and France formally recognized the government led by Francisco Franco and just as formally severed relations with the Republican government. The Americans followed suit. Soon, the Royal Navy cruiser HMS Devonshire was directly assisting the Spanish rebels in their capture of the island of Menorca. The British ship not only transported Franco’s emissary to those shores, but under threat of shelling forced the commander of the island’s naval base to hand over power to an officer loyal to Franco. At that time Adolf Hitler was collecting yet another region that lay between him and the borders of the Soviet Union. This was Czechoslovakia. It must be said that the creators of the treaties of Versailles and St. Germain provided the Fuhrer with a basis for his grievance against that nation. Because of those agreements, 3.4 million former Austrian Germans found themselves residing in and accounting for 22% of the population of the new state of Czechoslovakia, a nation cobbled together from the fragments of the old Austro-Hungarian Empire. Czechoslovakia was one of the most successful countries to emerge from the lands that had been subjected to the carnage of World War I. The new state of Czechs and Slovaks proved to be the only country in Central or Southeastern Europe to export capital on a broad scale. All areas of the Czechoslovak economy saw growth, but some sectors were particularly impressive. The most developed industries in that country were those engaged in the production of weapons and footwear. For example, by 1928 Czechoslovakia led the world in the export of shoes, boots, and sandals. However, this economic joyride proved short-lived – the young Czechoslovak state lasted only 20 years (from 1918 to 1938), at which point its allies from London and Paris decided to turn the country over to Hitler. The Third Reich needed to press onward toward the borders of the USSR, and Czech workers were needed to shoe and equip the German army. 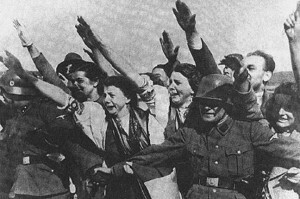 In the spring of 1938, the German press, galvanized by Hitler’s many bloodless victories, was waging an active campaign urging compliance with the demands of ethnic Germans living in Czechoslovakia’s Sudetenland. The German community within the country also became more active. 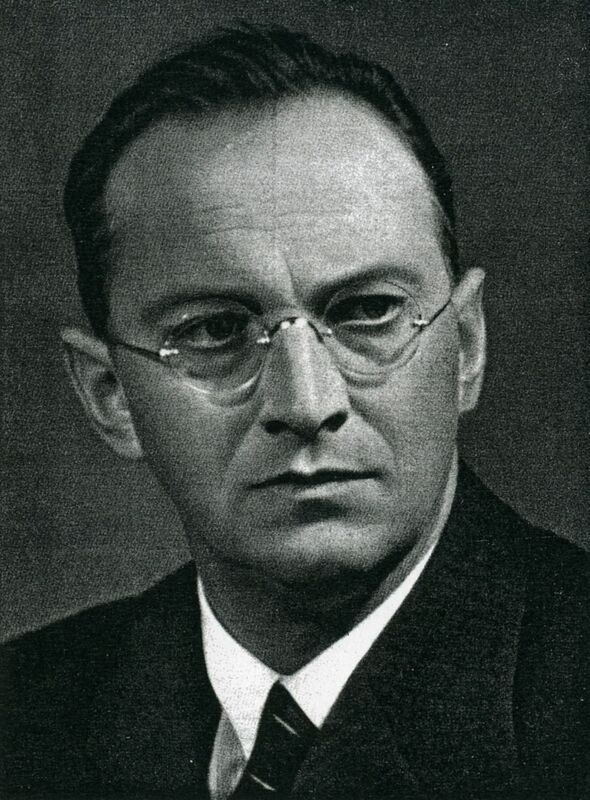 The Sudeten German Party, led by Konrad Henlein, spearheaded the idea of “returning all Germans to a single Reich.” The Austrian Anschluss provided an excellent pretext for raising the subject of the infringement of the rights of the German minority in Czechoslovakia. After all, the Austrian Germans were now part of this “united family” – so didn’t their “Sudeten brothers” deserve the same? 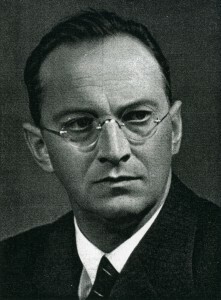 Henlein’s party demanded “territorial autonomy” for the Sudetenland. The Czechoslovak government was in no way prepared to surrender to the Germans. They had no reason to. The Czechoslovak army, one of the strongest in Europe, was ready to protect its country against any aggressor, and the Czechoslovaks had as much determination as they had strength. Against 39 German divisions consisting of 1.8 million soldiers, the Czechs could field 36 divisions of 1.6 million soldiers, and against Hitler’s 2,400 aircraft and 720 tanks, Czechoslovakia could count on its own 1,500 aircraft and 400 tanks. Nor should we forget the fact that the Czechoslovak army was in a defensive position, while the Germans would be forced to be on the offensive. Their treaty of alliance with France also gave the leaders of Czechoslovakia grounds for optimism. The Czechs were logically convinced that a powerful and useful ally such as Paris would not simply cave in to Berlin. Looking at a map it is clear that if nothing else Czechoslovakia’s geographical position should have compelled the French to actively come to her defense – should France find itself in an armed conflict with Germany, the Czechs could strike the Germans from behind. Furthermore, the Škoda military plants in the Czech lands produced as many weapons each year as the entire British arms industry. Who in his right mind would hand Hitler such a treasure? However, events surrounding Czechoslovakia began to take a very “strange” turn. Instead of active resistance to Hitler’s demands, petty intrigues developed. The result was the infamous Munich Agreement of September 1938, which gave Hitler everything he wanted. Perhaps the West was once again frightened by Germany’s military might? “The German armies were not capable of defeating the French in 1938 or 1939,” writes Winston Churchill. In other words, Hitler could not defeat the Czechs, the French, and the British at the same time – this was quite obvious. Why then, did the leaders of the “democratic countries” not act more decisively? Because they were not interested in a victory over the Germany they had spawned and reared! No one would kill an attack dog, bred for mortal combat, before the battle. 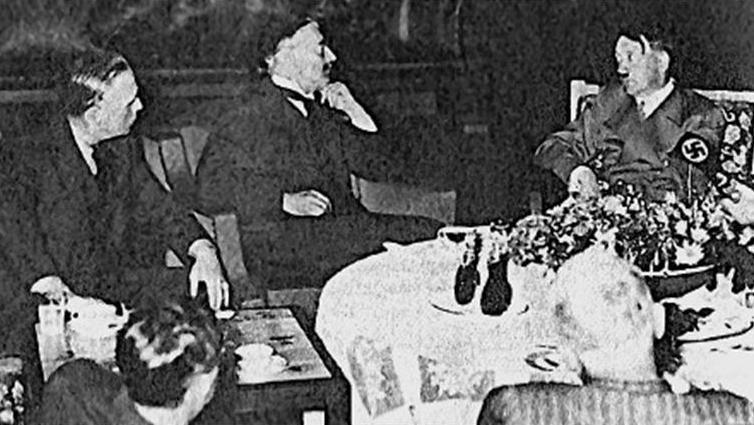 The first conference about the fate of Czechoslovakia was held in London between April 28 and 30, 1938. To the bewilderment of the Czechs, French statesmen suddenly endorsed the demand of English diplomats that a clash with Germany be avoided at all costs. On May 15, 1938, a dispatch from London was published in the New York Herald-Tribune, plainly stating that since neither France nor the Soviet Union were prepared to go to war over Czechoslovakia, Britain had even less reason to take up arms to defend that Slavic republic. And thus, Czechoslovakia should soberly assess her situation and recognize that her only option was a peaceful resolution of the question of the Sudeten Germans. Naturally, after such statements Hitler’s demands took on an even more uncompromising tone. And the piece published in the American newspaper “surprisingly” coincided with a very telling event. Two days before the New York Herald-Tribune went to press, Konrad Henlein, the head of the Sudeten German Party, arrived in London. The very fact of such a visit prompts some speculation. Henlein held several meetings with members of the British Parliament and the opposition. Afterwards, his demands (and therefore the recurrent theme of his speeches) changed from autonomy to the dismemberment of Czechoslovakia. Not only the German, but also the British intelligence services were actively working with the leader of the Sudeten Germans. This was no secret in Germany, but no move was made to block this contact. This was because at that time both the Germans and the British were playing for the same team, which was preparing to turn Czechoslovakia over to Hitler. “The British Secret Service was quite well informed … one of their agents, Colonel Christie, who had already conferred several times with Henlein, met him again at the beginning of August 1938, in Zurich,” read the memoirs of the head of Germany’s foreign intelligence. The Czechoslovak situation was even more curious because of the fact that in addition to the Franco-Czech agreement, an agreement between the Soviet Union and Czechoslovakia also existed. In the event of an attack, the USSR was required to come to the aid of the victim of aggression. However, there was an interesting detail in the text of the agreement: Moscow had to render assistance to Prague only if Paris offered the same type of help. In early September 1938, the French government asked the Soviet government what its position would be if Czechoslovakia were besieged. Moscow’s answer was simple: representatives from the USSR, Britain, and France would have to be immediately summoned in order to issue a declaration on behalf of these powers, warning that Czechoslovakia would be offered military assistance in the event of a German attack. As for the Soviet Union, that country was prepared to meet its obligations under its treaty. What type of reaction do you think the Soviet proposals received? Can’t answer? Then here’s another question: did those who had prepared Hitler for an invasion of the USSR have any need to avoid this aggression? To instead defeat Germany using the joint forces of France, Czechoslovakia, and the Soviet Union? Did they need Hitler to retreat and for his advance to the Soviet border be stopped? So rather than fending off the aggressor and taking a firm stand alongside the Soviet Union, the British “strong-armed” the Czechs. First, it was suggested to the government of Czechoslovakia that the treaties with France and the USSR be rescinded. Then the joint Anglo-French note of September 19 asked Prague to immediately hand over the Sudetenland to Germany. Czechoslovakia put up a feeble resistance. On September 20, 1938 the British and French ambassadors received the Czechoslovak government’s response. It included a request to reconsider the decision and refer the matter for arbitration in accordance with the German-Czechoslovak treaty of 1925. Such Czech recalcitrance could ruin everything. The fact is that in the event of a military conflict with Germany, France was required to intervene on behalf of the Czechs! And should this happen, the Soviet Union could come to the aid of not only Prague, but also Paris! A system of alliances would spring into action: the Franco-Soviet Treaty of Mutual Assistance of May 2, 1935 and the Czechoslovak-Soviet Treaty of Alliance signed on May 16, 1935. 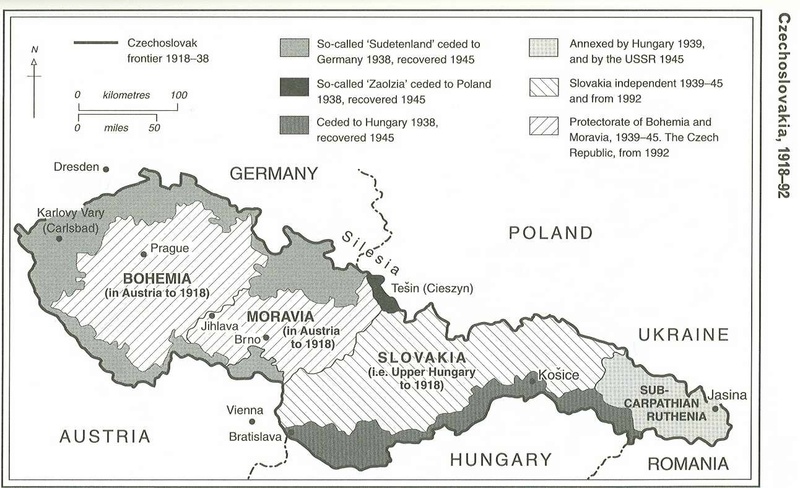 On September 21, 1938, the “allies’” ultimatum was discussed at a meeting of the Czechoslovak government. Their decision was not difficult to predict. The ministers agreed to what would literally be their nation’s suicide. On Oct. 1, 1938, German troops entered Czechoslovakia. They encountered no resistance. Later, the German generals inspected the Czech fortifications and nodded approvingly: how wonderful that the wise Fuhrer had managed to settle the matter peacefully. Because the Sudetenland itself was studded with top-notch battlements. “To the surprise of experts a test bombardment showed that our weapons would not have prevailed against them,” noted Albert Speer diplomatically in his memoirs. His assessment reveals the German army’s de-facto, total inability to successfully storm the Czech fortifications. This was why Western diplomats, soberly evaluating the Wehrmacht’s still-modest abilities, had been so insistent that Czechoslovakia surrender unconditionally! 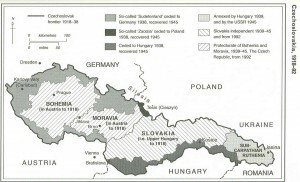 Seeing how others had so deftly managed to tap into this bonanza of free foreign territory, Hungary’s prime minister, Béla Imrédy, then protested that the interests of Czechoslovakia’s Hungarian minority had been “sidestepped.” And he got what he wanted – on November 2, 1938, 12,000 square kilometers of southern Slovakia and a small part of the region known as Subcarpathian Ruthenia (Transcarpathia), with a population of about one million, passed into Hungarian hands. So, who presented Hitler with Vienna and Prague? This was done by those who, despite their unswerving positions, “suddenly” allowed Austria to be annexed to the Reich. This was done by those who, against international law, did all they could to obstruct the attempts of Spain’s legitimate government to defeat its insurgents and emphatically “took no notice” of German and Italian aid to General Franco. This was done by those who, despite their treaty obligations, did not help Czechoslovakia, on the contrary, doing everything to ensure her capitulation. It is interesting to note that when the World War began on Sept. 1, 1939, Franco requested a loan to rebuild his country – not from his “friends” Mussolini and Hitler – but… from Great Britain. Churchill, Winston. The Second World War. Vol. 1. The Gathering Storm. Pg. 304. Schellenberg, Walter. The Labyrinth. Pg. 34. At the height of the German-Czech crisis, the USSR entered into a state of military alert and moved 60 infantry and 16 cavalry divisions, 3 tank corps, 22 independent tank and 17 air brigades up to the border with Poland, a country that the Soviet Union needed to cross in order to go to the aid of the Czechs. In addition, 330,000 reservists were called up and and tens of thousands of soldiers due for release were retained. (Bullock, Alan. Hitler and Stalin: Parallel Lives. Pg. 577). Churchill, Winston. The Second World War. Vol. 1. The Gathering Storm. Pgs. 274-275. More than seven decades have passed since then, but no one has learned anything. Once again we see in Europe the same “independent,” “sovereign” states readily complying with any of their masters’ whims. They happily install American radar and missiles within their borders, send their own soldiers off to distant Iraq without hesitation, and willingly scuttle deals with the Russian state or with private Russian companies that would be in their own best interests. Their master speaks – and with a big smile they stick their head in the noose, just as Czechoslovakia did in September 1938. Here’s a little known fact: the day after the Munich Agreement was signed, the British prime minister, Neville Chamberlain, invited Hitler for a private talk. And then he suddenly pulled a sheet of paper from his pocket: “We, the German Fuhrer and Chancellor and the British Prime Minister, have had a further meeting to-day and are agreed in recognizing that the question of Anglo-German relations is of the first importance for the two countries and for Europe,” reads the document. And “the agreement signed last night and the Anglo-German Naval Agreement” were regarded by the leaders of the two countries as “symbolic of the desire” of both nations “never to go to war with one another.” Historians usually forget about this document. However, it must have been this unimposing agreement that ensured Hitler’s aggression toward the East, not the Munich Agreement, which dealt only with Czechoslovakia! Chamberlain’s return to London from Munich is quite often depicted in historical documentary films. 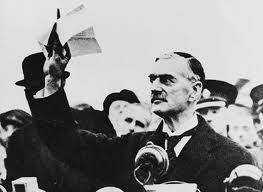 He is standing by his airplane, shaking a piece of paper in the air, and loudly proclaims: “Peace for our time!” And the audience thinks that British prime minister is holding a copy of the Munich Agreement. But in fact, Neville Chamberlain is clenching this supplemental British-German Declaration. Speer, Albert. Inside the Third Reich. Memoirs. Pg. 111. There must be a bottom line here. Which is/are the driving force(s), motive(s) for the uncompromisely stand England assumes towards Hitler s Germany with Churchill’s arise to power? What changed if at the top of the establishment they would be happy that he was heading towards Soviet Union, in his view Bolshevic Russia. No matter how financed Hitler was by whoever for pushing his anti-Bolshevic agenda, he had no doubt an agenda of his own which at a certain moment became a problem in certain corners. And besides, what’s the big deal? Lenin received help ( in various modalities ) while passing through Finland in his way to revolutionary Russia and got financed to produce it. Mao received American and Russian help at various different moments. But despite the fact that Hitler s own Ostwärts political agenda was very much in tune with England’s, no doubt, I don’t think it can be singled out as *the* Leitmotiv for all that he represents in totum in history. There is much more than what meets the eye. The article tends slightly to pass this impression.